Jerry Brotton's "A History of the World in Twelve Maps" traces the history of the world through the development and art of map-making by looking in detail at twelve maps that literally made history. 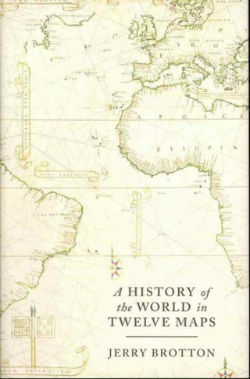 Jerry Brotton’s book “A History of the World in Twelve Maps” is a fascinating account of the development of both the science and art of map-making which he elucidates by looking at the cultural and political environnment in which twelve seminal maps were created. The maps in question cover 2,700-odd years of cartography, ranging from the very earliest, the Babylonian world map from Sippar, (Southern Iraq c.700-500 BC) to the much more recent digital satellite maps available to all on the famous Google search engine – as well as the mappamundi in Hereford and an early 15th century Korean map that even included Europe – among others. Professor of Renaissance Studies at Queen Mary University of London and also the presenter of the BBC4 series Maps, Power, Plunder and Possession, Brotton explains how world maps provide a revealing reflection of the times in which they were created: beginning in Antiquity when maps were regional, with no defined world borders (the borders being peopled by monstrous mythical creatures and barbarians) and moving on to the maps made in Christian times that reflected the spiritual destiny of man, with Jersualem and pilgrimage destinations at the physical and religious centre of man’s world – where maps were spiritual codes, guides for the curious pilgrim. Maps have always been at the service of religion and political ambition, becoming tools of imperial aggrandisment for the Spanish and Portuguese and later an aid to the mercantile ambitions of the Dutch and French, finally becoming a more retail product available to all at the click of a mouse. On a more technical level, the book looks at the perennial problem of projecting the world on to a flat surface, a dilemma that was partially solved by Ptolemy but remains as yet unsolved by Google. Maps are inherently imperfect – perfection is impossible – but each cartographer throughout history attempted to improve or find a superior compromise on previous attempts at mapping a sphere on to flat surface. The search for a solution is ongoing but Brotton is concerned that the technology that is advancing cartography, the Internet, is available to only 2 billion out of the world population of 7 billion. Cartography is seeing advances that only benefit a predominantly Western elite. Paper maps are becoming a thing of the past. Maps have throughout history both represented and actually shaped our world view. Brotton highlights the fact that maps can be props for propaganda and ideology and at the same time very personal, but they unfailingly mirror the needs and visions of the prevailing authority and power structure. 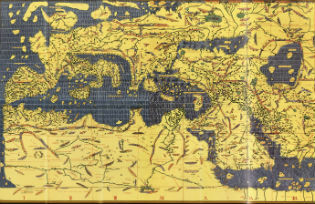 There is one telling story that he recounts about the attempts by the US Library of Congress to purchase the only remaining woodcut of a world map made by Martin Waldseemuller in c.1507. The map was the first that designated what was previously “terra incognita” as “America” thus giving a historical authentication to the country’s identity. Maps are historical documents in their own right with an almost fetishistic power, as in this case. Mapmaking was not always a safe profession despite being based on an enduring human instinct. In the 16th century, Gerard Mercator, whose 1569 map is still a milestone in the science of mapmaking, was jailed for heresy, as his work may have willfully or perhaps inadvertently given succour to Lutheranism. The questions he was asking about creation and the heavens brought him into conflict with religious orthodoxy. Despite the fact that cartography has now been extricated from the clutches of religious dogma and imperial ambition, the more democratic mapping of Google still faces the problem of offering a partial vision of the world, still unable as we are to offer a unified vision of humanity. 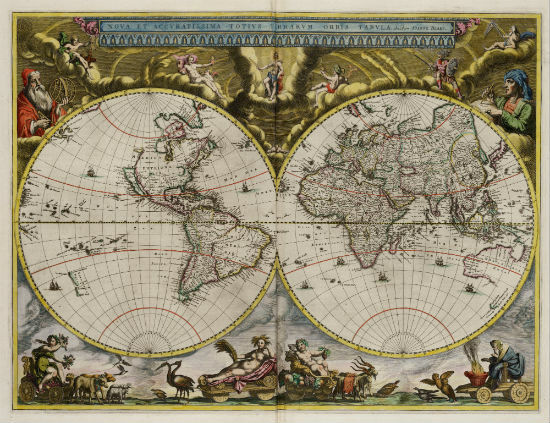 Joan Blaeu’s world map from the Atlas Maior 1664 edition. Mankind has attempted for three millenia to create a universally accepted map of the world, coming close when NASA published the photograph taken in 1972 by the astronauts on Apollo 17, showing planet Earth in its entirety and all its splendour but the task has been doomed by the impossibility of creating a commonly accepted global projection of the earth. Brotton walks us through the creative process which tried to resolve the problems faced by map makers, from the scaling of maps, perceptions of reality, orientation and projection. Each cartographer responded differently depending on their personal, emotional or religious make-up and on their financial circumstances. Brotton has demonstrated that cartography is an invaluable science for understanding the development of humanity. This is an excellent book with a slightly misleading title but as informative as it is well-written. Highly recommended.